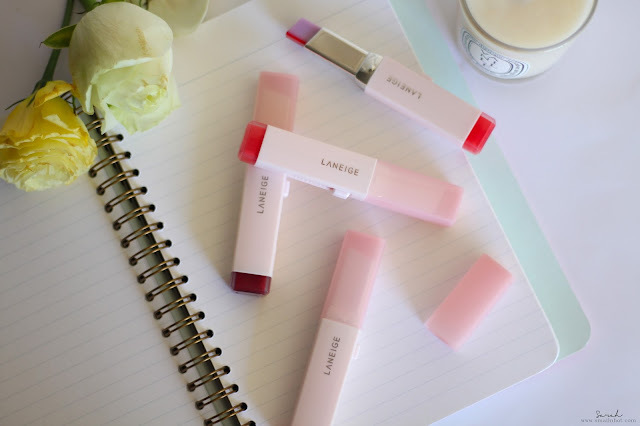 Laneige Two-Tone Tint Lip Bar - Lip Addict or Victim ? Laneige Two-Tone Tint Lip Bar expresses natural gradation by combining the features of defining tint and moisturizing lip balm. It comes with a V-cut design to optimize the color on the center of the lips with a single sliding application as color spreads naturally on the lips. You'll LIKE it if your lips crave for moisture, a tint of color and a finishing that doesn't resemble that of a raisin for once. 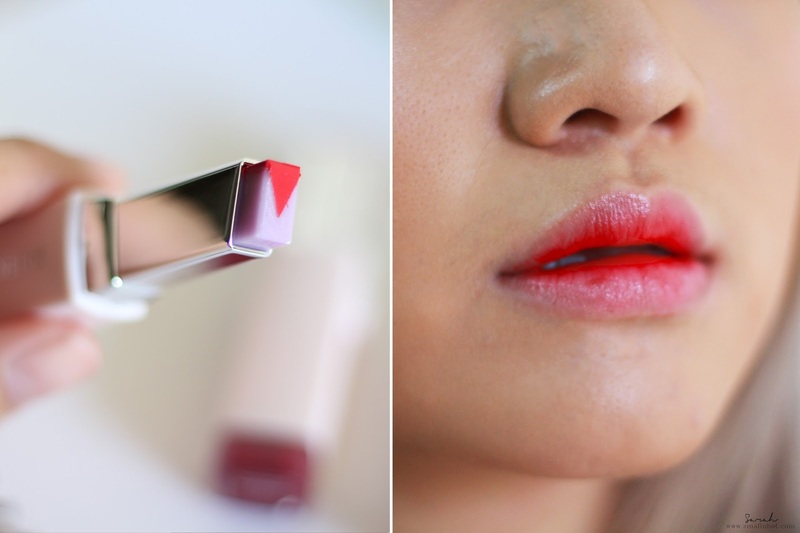 You'll HATE it if you are looking for a pigmented, long-lasting and not transferable lip tint. This new Laneige Two-Tone Tint Lip Bar has a total of 8 pretty shades, all with the ingredients and technology of Laneige Lip Sleeping Mask, providing moisture to your lips. Just like the previous Two Tone Lip Bar, it creates a sheen of light and semi-opaque colour payoff. Also after applying this, my lips look much more plumped, hydrated and less raisin like throughout the day. I think if the colours in the bullets had transferred exactly onto my lips, I would be much more amazed and loving it, because the sheerness of the Two-Tone Tint Lip Bar it doesn't really do any justification on my lips. All the swatches felt more or less the same on my lips with just a minute difference. Even the darkest shade, 08 Cherry Milk's color doesn't deliver the deep cherry color as shown on the bullet, it turned out to be more of a cool reddish tone. Aside from that, the new Laneige Two-Tone Tint Lip Bar has a unique V-cut design on the bullet. And you may ask, does the V-cut design make application easier ? Yup, it does. 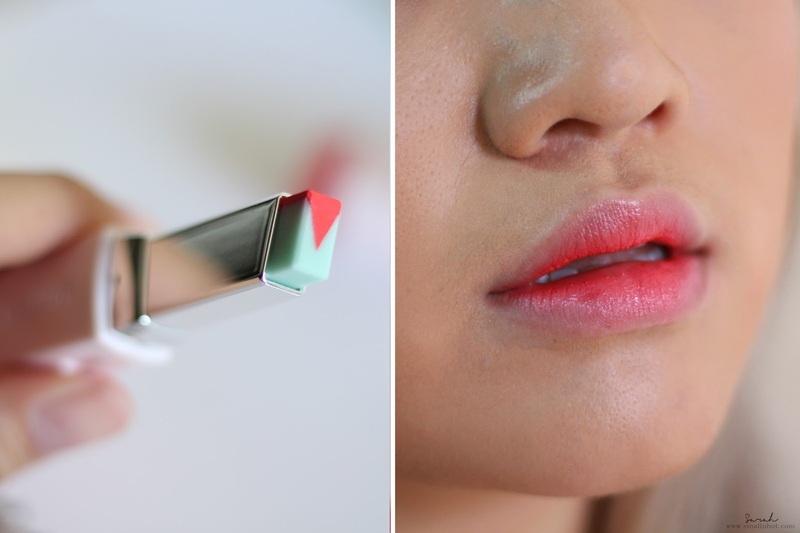 You can create the Korean beauty gradient lips effortlessly with just one swipe. But if you have a slightly darker skin tone, maybe two to three swipes of it will be needed for a more pigmented color payoff. 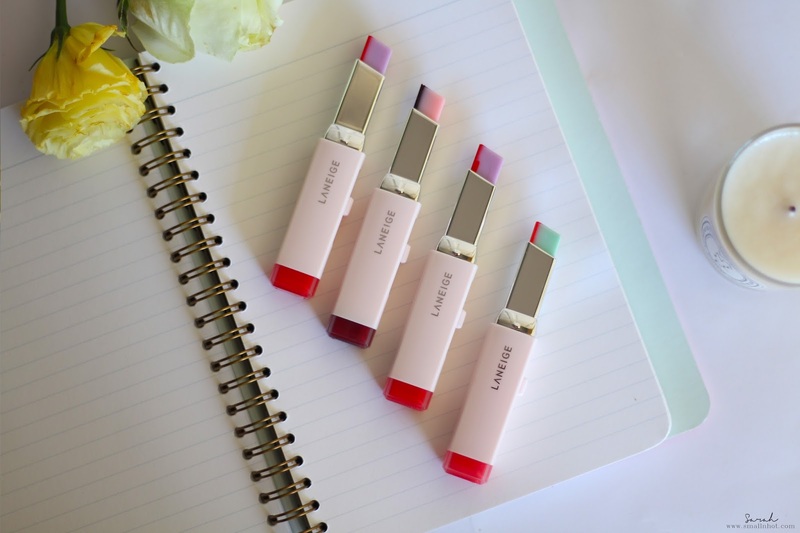 The shades available will suit many k-beauty makeup wearers and I can feel that it could become everyone's go-to for a hydrating lipstick/lip balm hybrid. In the following shots, I have tried on only three (not four because I got an extra 07 Lollipop Red) of the Two-Tone Tint Lip Bar to show you guys the true color swatches on my lips, which includes 03 Tint Mint, 07 Lollipop Red and 08 Cherry Milk. 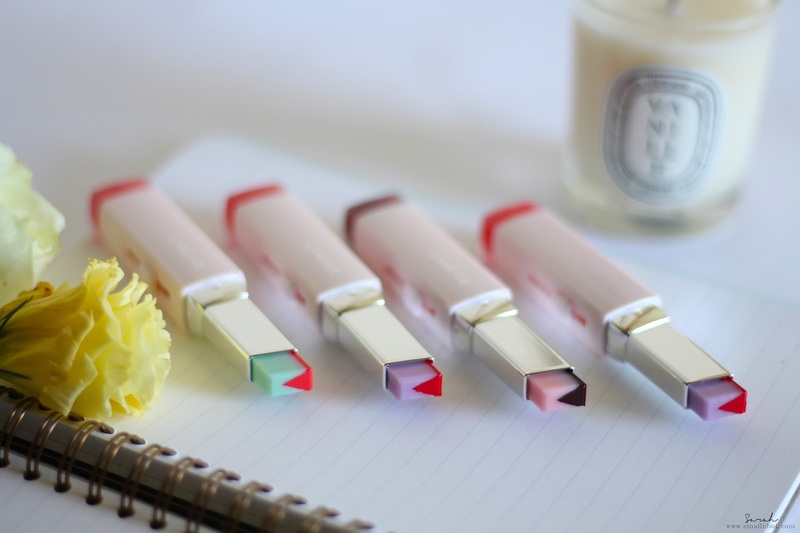 Overall, I do enjoy the new Laneige Two-Tone Tint Lip Bar as a day to day tinted lip balm because it hydrates and plumped up my lips with a tint of color, but for those heavy duty makeup day, the color of these lip bar will not make the cut. So it's probably worth making a visit to Laneige counter to swatch it and play around with it before you purchase; because the shades available are not universally flattering due to the color payoff. 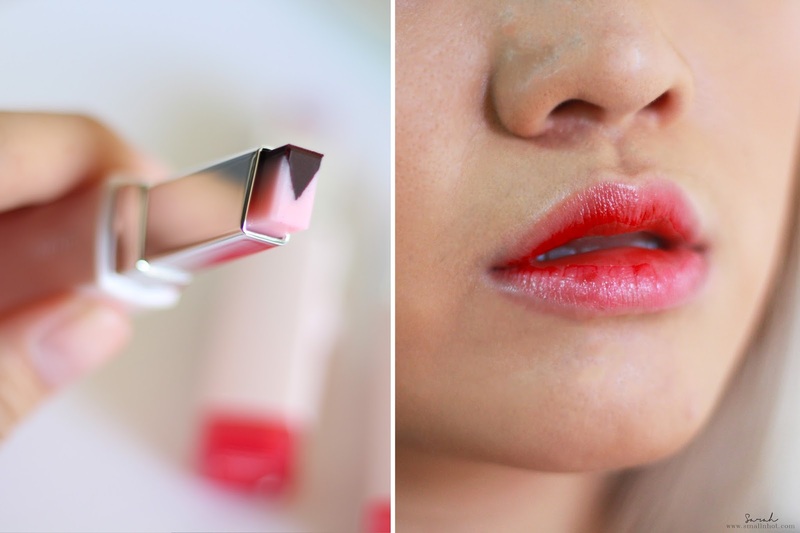 Again, if you are looking for just a hydrating lip tint, then this is the one !